The first in our KidFun line of games. These card and board games appeal to kids ages 6 and up. 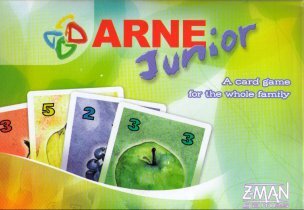 In the card game, Arne Junior, the goal is to collect the most points in your fruit. There are also special white cards and black cards that do wacky things and add fun twists to the game. For example the +3 card allows you to draw three extra cards. The chameleon allows you to change one fruit into another. The hungry bird can eat the points off a fruit (unless caught by the net). Arne Junior is also great for counting and math skills.